If you choose to allow transaction posting vs. batch-only posting, even if you mark 'Post Through GL Files', individual transactions will not Post Through the GL, they will only Post To the GL. Batches, however, will post through if 'Post Through GL Files' is checked in Posting Setup. 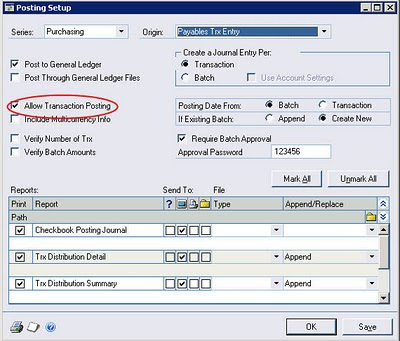 The exception to this rule is Bank Transactions, which always post through the GL because there is not batch posting in Bank Transactions.